Tai Woffinden will not ride for Wolverhampton in the 2015 Elite League as his schedule will keep him too busy. 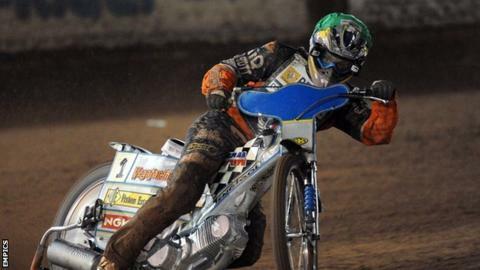 Ex-world champion Woffinden, 24, has ridden for Wolves for his whole career in the British top flight, helping them win the Elite League in 2009. But during his defence this year of the world title he won in 2013, Woffinden's packed racing schedule became too much. The Great Britain Grand Prix team captain had to take time off in July, suffering from exhaustion. He has opted to ride in the Polish and Swedish Leagues in 2015, as well as the World Championship, but drop the British Elite League from his schedule. "When I was appointed captain of my country it meant so much to me," said Scunthorpe-born Woffinden. "But I have spoken to a lot of different people around me and particularly those who are close to me and I simply cannot afford a repeat of 2014 when everything became too much for me. I was mentally and physically exhausted and had to take some time off, I don't want to be doing that again. "The news of Woffinden's withdrawal from British league speedway is a disappointment but not a great surprise. It was clear throughout the season that he was struggling to cope with the extraordinary demands of racing in three leagues as well as defending his World Championship. "The obvious conclusion was to drop a league from his commitments. If we look dispassionately, the Polish and Swedish Leagues are stronger, but perhaps the most crucial point - and one raised by Woffinden - is that both of those leagues commit him to only one day of racing a week, while British Elite League clubs will continue to run on various nights. Polish League matches are all on Sundays, and Swedish matches all on Tuesdays. "There will be many in the British speedway community who will be upset by Woffinden's decision not to race in the UK next year. Woffinden stresses that he is still proud to represent Britain in world speedway and, if he mounts a stronger bid for the world title next year as a result of this decision, he may well prove his point." "I have to take responsibility, it was my decision to pack my diary with as many meetings as possible during my time as World Champion but it's different now and I'm hoping this decision helps me realise my ambitions for 2015." Wolves boss Peter Adams said: "It's naturally disappointing for British fans but we have to understand and respect Tai's decision. "If Tai was to be back with Wolverhampton in 2015 we would want the 2013 version and not the 2014 version. "Tai has given me his assurance that he has no interest in riding for any other club in the UK and he still regards Wolverhampton very much as his club. Whilst that is the case I am happy to continue supporting him in his Grand Prix career - but with a strong emphasis on the fact that he doesn't crop up riding for another club. "I can also reveal Tai didn't need to commit to all 28 league fixtures with Wolverhampton as the AGM saw a proposal passed whereby a position in the team can be shared between two riders. That decision was taken because Tai isn't the only rider who has been talking like this, but he was aware of that before he came to his final decision. "It's a sad day in many ways but I am certain it's not the end of his Wolverhampton career, he will be back."